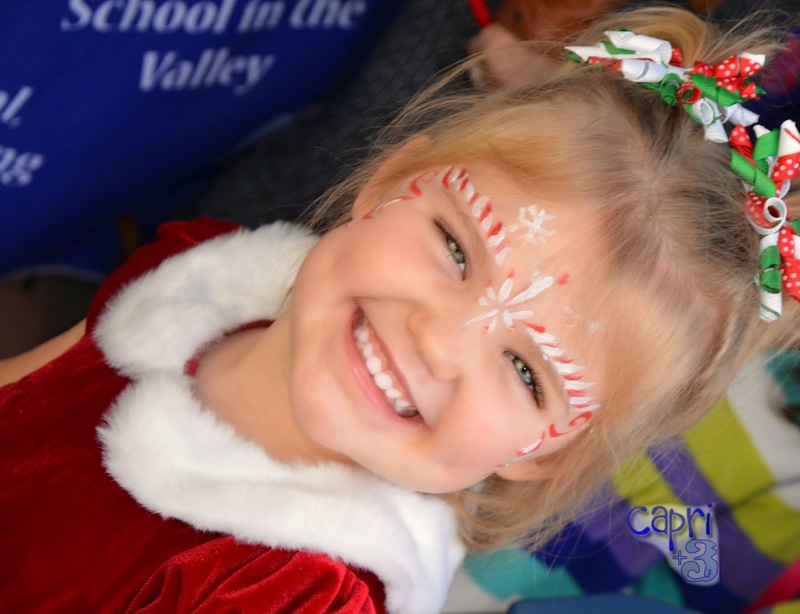 We had so much fun at the Festival of Books, that we decided to try out another event dedicated to literacy, The Santa Clarita Literacy & Arts Festival. We had just done a holiday photo shoot with the Sugar Snaps and so they were dressed in holiday attire. This event was so well organized! We were very impressed. They had so many booths set up with learning activities related to books and even had a section where children could read books to therapy dogs. 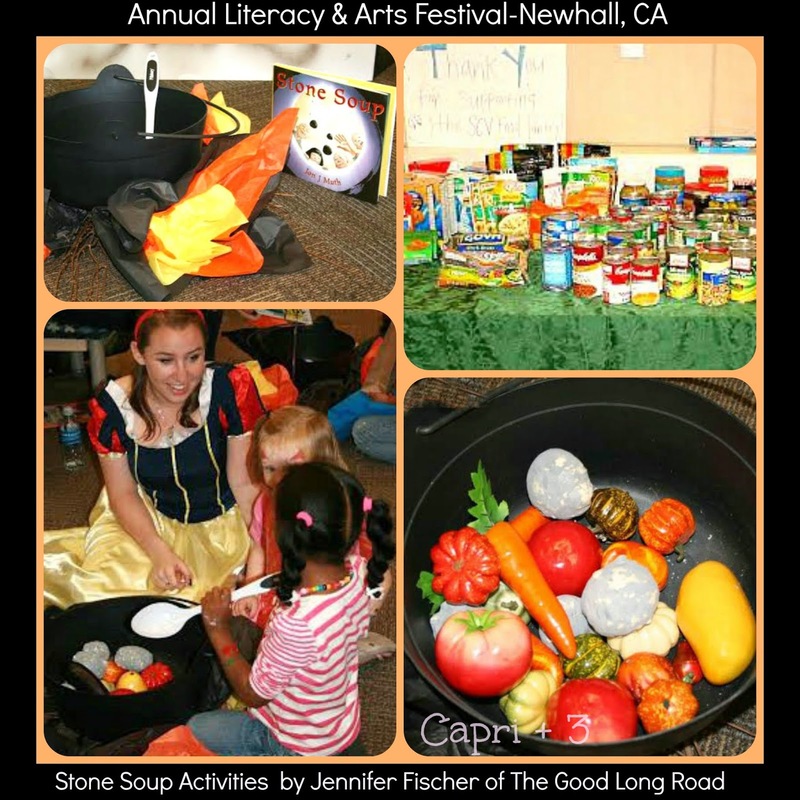 One section, organized by Jennifer Fischer, of the Good Long Road, had the theme of Stone Soup. She set up cauldrons so children could ‘shop’ at the produce stand and put vegetables in the cauldron to make pretend soup as they listened to the story. There was also an area set up where families could donate canned food to the local food pantry. Another section had a craft in the same theme which is pictured below. The Sugar Snaps colored vegetables and fire and pasted them into and around a black cauldron that was pre-cut for them. If you have not had a chance to check out The Good Long Road, I suggest starting with Jennifer Fischer’s post on Stone Soup. Then, stay a while. 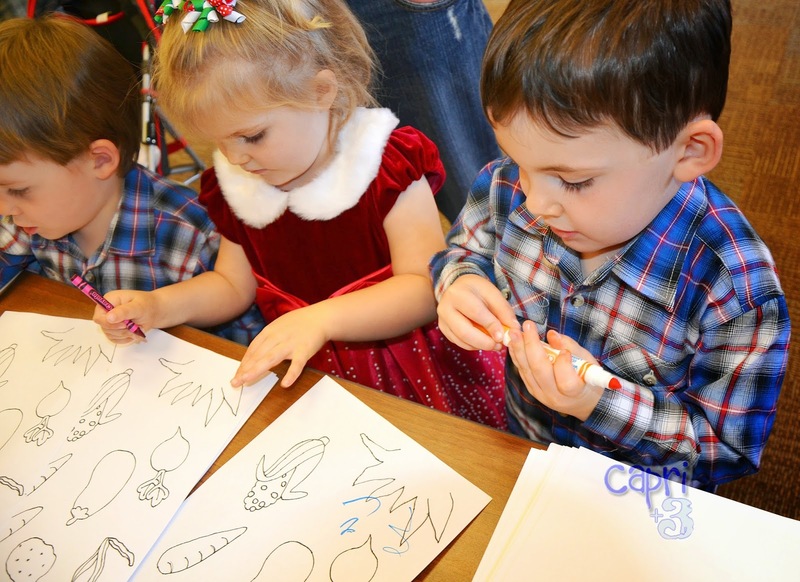 There are so many great educational activities to do with your children as well as ways to get involved in the fight against hunger in your community. 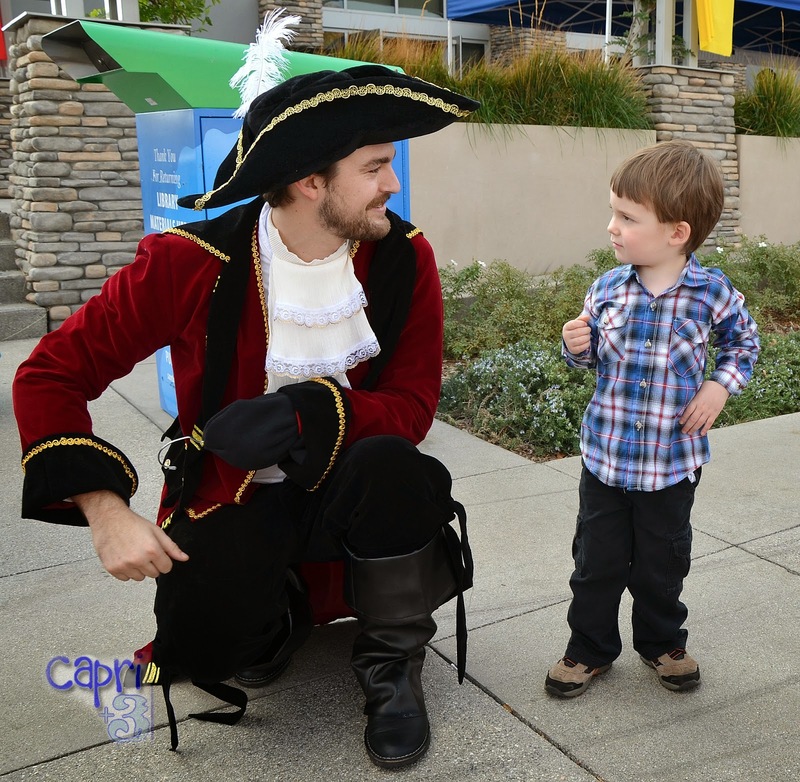 We ran into Captain Hook who was walking around interacting with the children. Grayson was especially excited to make his acquaintance. I was excited to meet this amazing artist, Pablo. 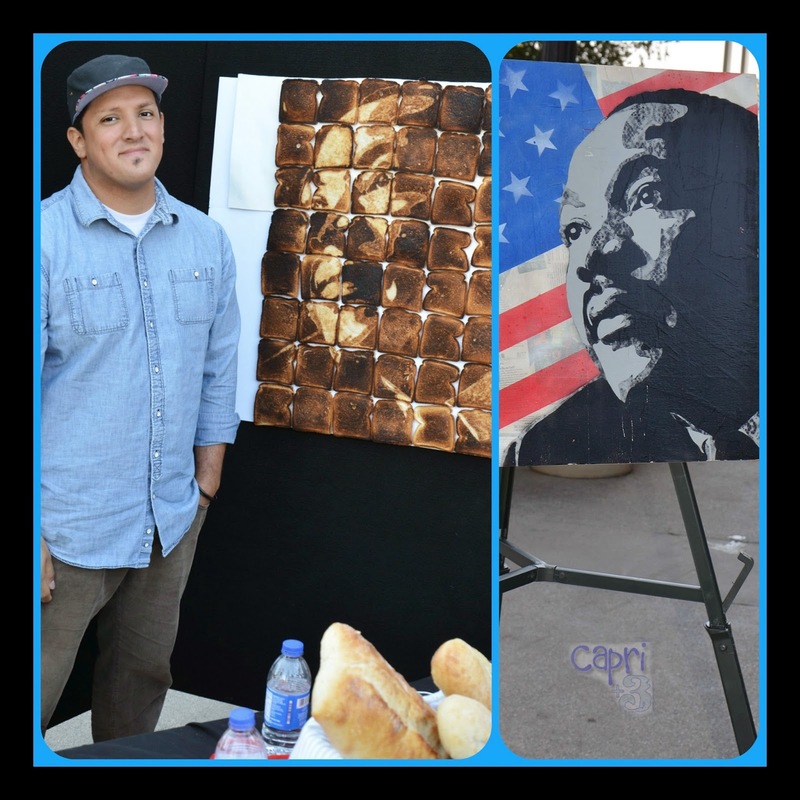 He painted the picture of Martin Luther King, Jr. on the right and recreated it using toast on the left. He was still working on it when he paused so I could take his picture and ask him some questions. He had never done a picture in toast before! They asked him to try a new medium and he agreed. He said he might make the background black next time or cut perfect squares so there is no space between the toast if he were to try it again. I was in complete awe of his talent! 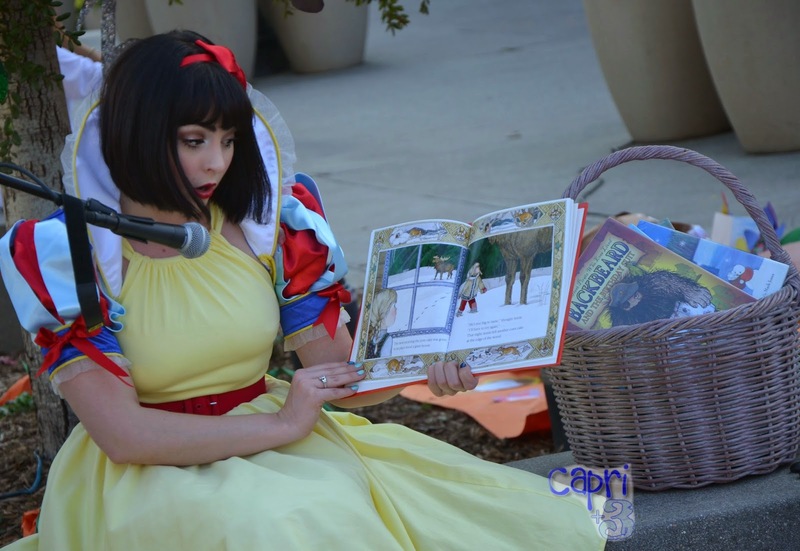 In addition to having characters read books, they also had books that were read by the author. This is Shannon Okahara, reading her book Tooth on the Loose. I was excited that they had FREE face painting. 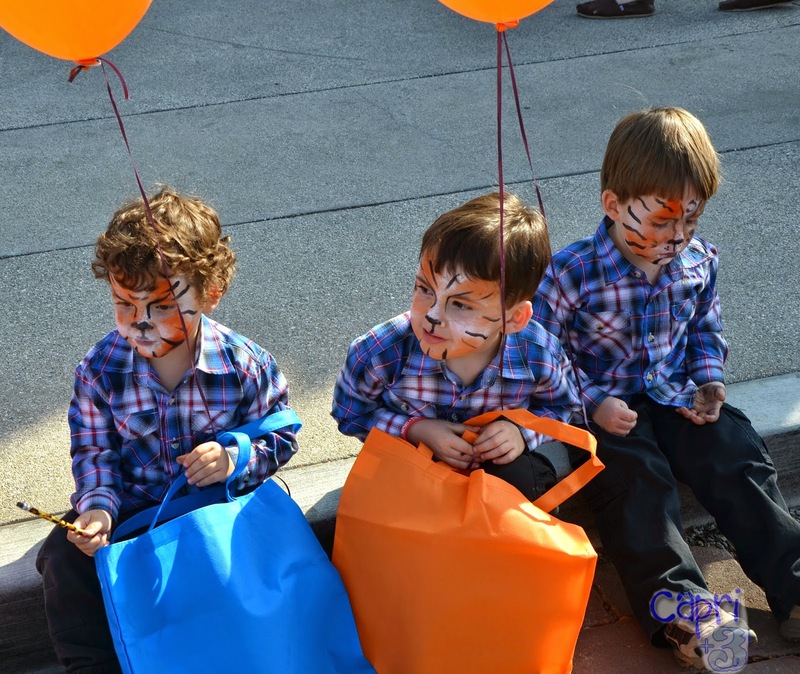 All three boys opted to be tigers. Grayson giggled when the paint brush tickled his face. The library provided free books that were out of circulation for children of all ages. There were stations where the children could do activities and collect stickers and win a prize when they collected them all. They each took home a reusable bag with a coloring book and crayons. If you are ever in the Los Angeles area at this time of the year, I recommend checking out the Literacy and Arts Festival. 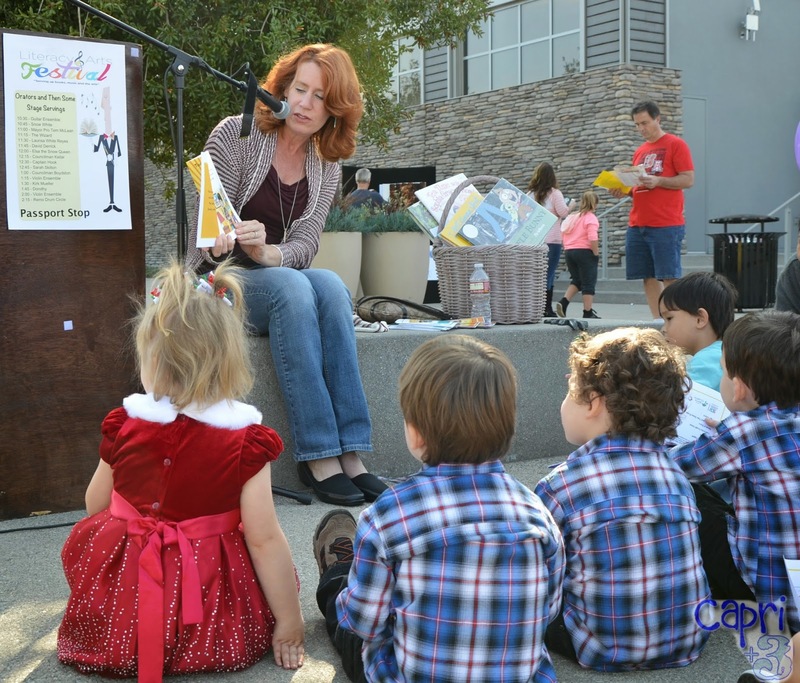 Have you been to any book or literacy festivals? Which ones have you attended? What a great post! I'm so happy to see how well the event turned out, since I was only in one area of it for much of the day. It looks like the Sugar Snaps had so much fun. It was so nice to see you and them! Our family loves events like this. You did an AWESOME job with Stone Soup and the post-it note flip books. The Sugar Snaps loved your activities (and the rest of the event too). I am sure K will love doing stuff like this when she is older. And she has an amazing photographer as a Mama who will capture it all! That is wonderful that your father was there promoting his book! It is an awesome opportunity for children to meet authors. I am sorry we did not get to meet your Dad. Maybe we can meet him next year at the event! So fun! How did Pablo "paint" the toast? Did he use a blow torch? I'm in awe! And Snow White was there? She looks beautiful as always! Love it! It was a really fun event. 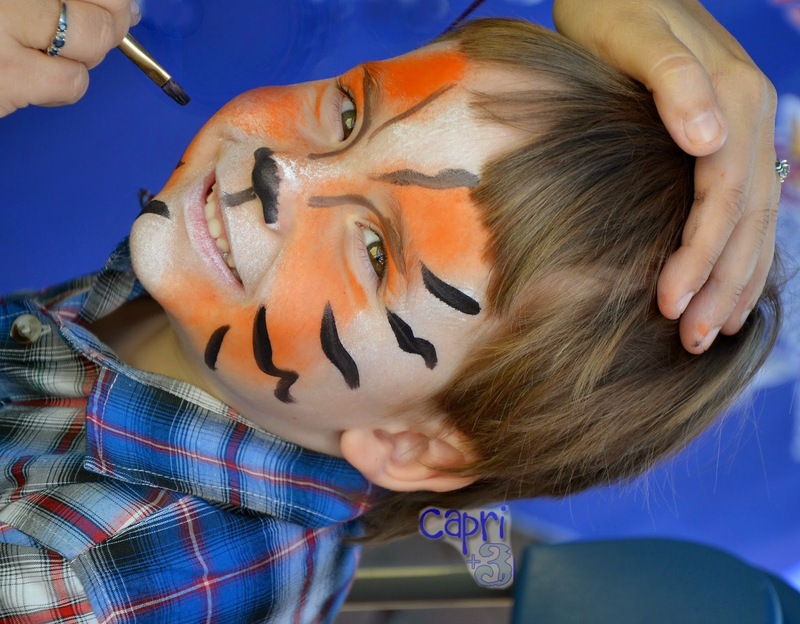 The face painting was a bonus! Pablo carved the toast rather with a small cutting tool. It was pretty amazing! That looks like so much fun. And I totally loved the toast art part. From next year onward, I also plan to take my daughter to some literacy events. 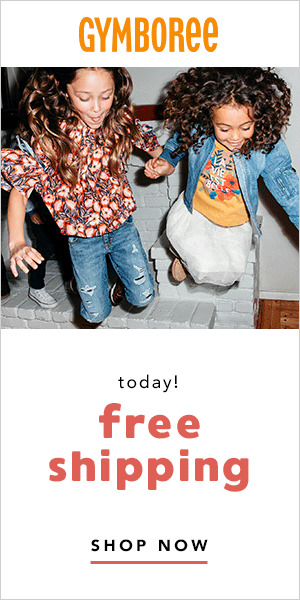 Its great for the kids. I am sure your daughter will love those events. They are so well done and have great learning activities. I think I will view toast a little differently after this event. That was amazing. This festival looks great! Great activities and interesting things to see! It was a very well put together event. We felt lucky to attend.